Ten years have passed since the signing in Caracas, on October 30, 2000, of the Integral Cooperation Agreement between Cuba and Venezuela by Comandante Hugo Chávez Frías and Comandante en Jefe Fidel Castro Ruz. Everything that we have achieved since then has been momentous. 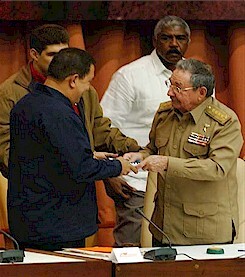 Raúl presents Chávez with the second copy of the Economic and Social Policy Development Project. The first copy was presented to Fidel. To date, this Integral Cooperation Agreement between Cuba and Venezuela has constituted the fundamental basis for the consolidation of our links. Through its execution, we have carried out actions of significant economic and social benefit to both peoples. The sectors which have most benefited from these programs include those of public health, education, culture, sport, agriculture, energy savings, mining, informatics, telecommunications and the comprehensive training of cadres, among others no less important. The Social Missions that we are developing in conjunction with Venezuela, such as Barrio Adentro I and II; the Educational Missions, Barrio Adentro Deportivo; Operation Miracle; Mission Campo Adentro, and the Medical Training Program, with a significant improvement in the living conditions of the Venezuelan population, fundamentally for its most vulnerable members, have surpassed the limits of bilateral exchange and are extending, as an expression of our internationalism, through the countries of the Bolivarian Alliance for the Peoples of Our America (ALBA). We are directing our efforts to the economic union of Cuba and Venezuela within a new kind of relationship that will facilitate the greater ordering, rationality and efficiency of joint projects and which constitutes, at the same time, an important step toward the objective of achieving genuine economic complementariness, based on the optimum utilization of the infrastructures, knowledge and resources existing in both countries and, above all, on the political will of our governments. Solidarity, understood as a commitment to mutual support and shared efforts to attain sustainable development and opportune attention to their emerging needs, according to their possibilities and shared responsibilities. Cooperation, as the will to consolidate their relations, directed toward the development of joint projects and strategic alliances of mutual benefit. Complementariness, understood as a commitment to identify and develop joint projects that will permit the integration and synergy of their capacities in accordance with their potential and common interests. Reciprocity, as an obligation to establish a relationship based on just considerations, taking into account differences and the principles of equality and good faith. Sustainability, understood as a commitment to identify and develop cooperative projects, directed at attaining sustainable development from economic, social and environmental points of view. Technological sovereignty, recognized as the right of each state to decide its own technological development, through taking advantage of its potential, in order to change current patterns of dependence and consumerism, thus guaranteeing that the needs of the respective ALBA national markets and the countries of the region are met. Economic union, understood as the construction of a space within the political context of the countries of the Bolivarian Alliance for the Peoples of Our America, which will allow it to present itself as a bloc facing organizations of other nations or spaces of the same nature. End of quote. The effort that we have made to date commits us to continue working together to advance to the maximum in shared projects. We have to plan in the medium and long term, with a strategic vision between both countries and with a view to extending this cooperation to sister nations of the Bolivarian Alliance for the Peoples of Our America and the rest of the region. Given these proposals, we have decided to re-launch our Cuba-Venezuela Integral Cooperation Agreement for the next 10 years. The development of our relations has not been exempt from obstacles. Together, we have imposed our will over adversities, many of them generated by external factors opposed to the advance of our revolutionary and emancipatory projects. The development of these links has not been paralyzed by any difficulty, not even financial ones, because the basis of our actions is cooperation and solidarity to our mutual benefit. What is required now is the rigorous follow-up and assessment of everything agreed in order to guarantee the development of both economies and meet the needs of social development. This is what our peoples are demanding and what constitutes a pillar for the strengthening of the ties of sisterhood between the two nations. While confrontations in Latin America are intensifying among the reactionary and conservative sectors, which defend a dependent and exploitative political economic model, on the other hand the revolutionary and progressive forces committed to justice, equality and the independence of the peoples of the region are advancing. In this context, the relationship between Cuba and Venezuela is becoming the finest example of how links between the peoples should be, and is acquiring a greater dimension, bearing in mind that it is developing in the midst of the current difficult international situation, in which political and economic instability is paramount, and in which the global economic, energy, food and environmental crises are being compounded by grave threats to world peace. In addition to celebrating the 10th anniversary of the Integral Cooperation Agreement between Cuba and Venezuela and its re-launch for the next 10 years, our meeting this afternoon presents an opportunity to convene the Party and all our people to participate in the preparatory process for the 6th Congress of Cuban communists. The Political Bureau has agreed to convene the 6th Congress for the second half of April next year, on the occasion of the 50th anniversary of the Bay of Pigs victory and the proclamation of the socialist nature of the Cuban Revolution. On August 1, in the 5th Session of the National Assembly of People's Power, I explained that we were making advances with respect to the studies under the responsibility of the Congress Economic Policy Commission and that the diverse working groups created were functioning uninterruptedly in drafting proposals to be discussed with both Party members and the population. For all of these reasons, the 6th Congress will concentrate on the solution of problems within the economy and on the fundamental decisions involved in the updating of the Cuban economic model and will adopt the economic and social policy development project of the Party and the Revolution. The Congress is not only the meeting of those elected as delegates, but also the previous discussion process on the part of the membership and of all the population on the alignments or decisions to be adopted at the Congress. In that speech at the National Assembly I also said, "Unity among revolutionaries and among the leadership of the Revolution and the majority of our people is our most important strategic weapon, the one that has made it possible for us to reach this point and continue perfecting our socialism in the future," and that, "Unity is fomented and reaped in the broadest socialist democracy and in the open discussion of all matters, however sensitive they may be, with the people." For that reason, the 6th Congress will be one of all the membership and of all the people, who will actively participate in the adoption of the fundamental decisions of the Revolution. The Economic and Social Development Policy Project is to be published tomorrow and a national seminar of leaders and specialists will immediately begin in order to guide the process of the mass discussion of this document. Subsequently, from November 15 to 30, seminars will be organized in all municipalities to prepare the cadres who will take part in meetings with the nucleuses of the Party, workers and in all the communities. This mass process will take place over three months, from December 1 to February 28. From that date, there will be reserve of time, until March 11. At the same time, opinions and suggestions will be collected and analyzed to be taken into account for the adoption of the document by the Congress. This plenary session will involve the Councils of State and Ministers, the presidency of the National Assembly, the Political Bureau, as well as hundreds of cadres and economists from all the provinces of the country who are preparing themselves to contribute to explaining to Party members and the people the content of the proposed decisions, as well as to listen and convey their opinions. As I noted this past April 4 at the Congress of the Union of Young Communists, "today, more than ever before, the economic battle is the principal task and the focus of the cadresâ€™ ideological work, because the sustainability and the preservation of our social system depend on it." For that reason, this constitutes the only theme of the Congress and later, within the same year, we shall hold the 1st National Conference of the Communist Party, to deal with other matters of an internal nature that are not discussed at Congress and which also need to be improved in the light of the experience of these last 50 years. I should clarify that we had announced holding the Conference first and then the Congress, but given the advances in preparing the documents, we decided to invert the order and hold the Congress first in order to discuss the principal issue, which is the economy. Precisely, one of the directions of this project, states: "To give priority to participation in the Bolivarian Alliance for the Peoples of Our America (ALBA) and to work swiftly and intensely on economic coordination, cooperation and complementation in the short, medium and long term, for the attainment and profundity of the economic, social and political objectives that it is promoting," which is closely related to the issues covered in the course of today between ministers of the two governments. We have already presented to the leader of the Cuban Revolution, compañero Fidel Castro Ruz, the first copy of the Policy Development Project. To you, compañero Hugo Chávez Frías, Comandante of the Bolivarian Revolution and President of that sister Republic, I am presenting the second copy.